A member of the original cast of Andrew Lloyd Webber's School of Rock the Musical; Malachi completed a seven week workshop working closely with producer / composer Andrew Lloyd Webber and Director Lawrence Connor as they prepared for the December 2015 opening at Broadway's Winter Garden Theater. 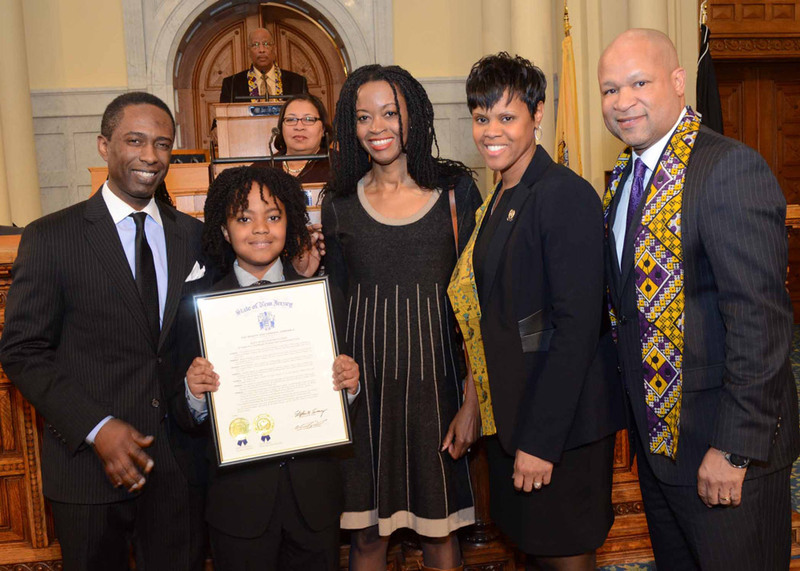 Malachi was honored with the NAACP Youth Award and received two Citations from the State of New Jersey's Senate and General Assembly; one for his ongoing contribution to the arts and the other for his humanitarian work, which includes partnering with UNICEF to help children worldwide. Also honored were Assemblyman for New Jersey’s 35th Legislative District, Benjie E. Wimberly. Yvonne Witter, President of the Bergen/Passaic Chapter of the National Coalition of 100 Black Women, Inc., as well as Mrs. Joy Kurland, Director of the Jewish Community Relation Council. Whereas, New Jersey's young people who set their goals high, who persevere in the pursuit of those goals, and who reach their desired milestones and accomplish their objectives stand as an example and an inspiration to their fellow citizens of all ages. Whereas, it is both proper and fitting for this Legislature to pause in its deliberations to praise the history of Black people, whose most glorious chapters are still being written as generations of African-Americans contribute in full measure in the fulfillment of the American promise; now, therefore, be it further resolved by the Senate and General Assembly of the State of New Jersey that this Legislature hereby Honors Malachi Samedy. Along with organizations like the NAACP and the Congress of Racial Equality, the National Urban League has played a pivotal role in advocating the civil rights of people of color. As part of the Urban League the ULBC provides opportunities for youth that include workshops on financial literacy, domestic violence among our youth, test preparation, and life skills for teens. At this, The 95th Annual Fundraiser and Scholarship Gala, the ULBC honored students for their academic excellence and their community involvement. Malachi was honored to be invited to perform, and excited to meet host Anthony Johnson, Emmy award-winning journalist, and anchor of ABC 7 Eyewitness News. The Young Men Employment Network Students Conference (YMEN) presents young men with the opportunity to interact and learn from professionals in all areas and disciplines. The conference integrates academics with realistic and tangible experiences designed to help develop skills for navigating a path from high school into a career or college environment. Over 400 student participants had the opportunity to engage industry CEO's and Presidents. Industry professionals lead workshops in Technology, Manufacturing, Health Care, Transportation, Business and Entrepreneurship, Education, Social Work, Retail, Entertainment, and Construction. Malachi was honored to be invited by YMEN creator Matt Stevens to be an official speaker along with author Dr. Alex Ellis, and Filmmaker / Director Jordan Coleman of Nickelodeon's the Backyardigans. Founded Feb.12, 1909, the NAACP is the nation's oldest, largest, and most grassroots-based civil rights organization. It's more than half-million members and supporters throughout the United States, and the World are the premier advocates for civil rights in their communities, campaigning for equal opportunity and conducting voter mobilization. On April 27, 2013, the NAACP celebrated enhance leadership roles of women serving as advocates for issues affecting women and children. Among the recipients were four-time Emmy Award-winning journalist Brenda Blackmon, Mayor Bernadette P. McPherson, Councilwoman Lizette Parker, Bergen County Sr. Executive Vanessa LaGarde and SocialWorker Jamayla Scott. Malachi was Honored to be invited as the featured artist by NAACP President Anthony Cureton, and had the privilege of receiving an award for his ongoing support for the NAACP and children nationally. As part of the international exchange program, the Nanjing Students of China have traveled all over the world, learning and absorbing the social structure and educational process of foreign lands as they share their culture and talent. In an effort to Gain global awareness a model school is selected by the Chinese government and given the opportunity to host up to seventeen children at a time. *LiLi Lin, Director of the EPSD Exchange Program will travel to China in the near future to further the program, among her topics of discussion is Malachi's first invitation to perform in the People's Republic of China. The children's seven day stay consisted of personal time with their host families, classroom interaction, and sight seeing. On this, their first trip to America the students visit: The Museum of natural history, the empire state building, Ellis island, The Statue of Liberty, and no trip to The United States would be complete without a tour of "Toys R US" in times square. Held at The Dizzy Gillespie Auditorium,"The China Night Concert" was a celebration of the Chinese culture and pride, illustrating China's historical past, and the promise of China's future. This amazing display of cultural exchange featured various artist including the Huaxia Chinese Chorus, the King's Academy of Dance Arts, and the McCloud School Choir. Malachi was honored to be invited as the special guest performer, and the recipient of a heart felt gift from the students and staff. The students were amazed Malachi spoke mandarin, the language of their home land, and Malachi was just as amazed of the students talent, humility, and grace. Over 800,000 children under 18 years of age are abducted annually according to the United States Department of Justice. 60% of those abductions comprised of children 6 to 14 years old. The Rose Brucia Educational Foundation was created out of the tragedy that took place in 2004 after 11-year-old Carly Brucia was abducted in Sarasota, Florida. Matthew J. Barbis, Founder and cousin to Carly, wanted to help reduce future child abductions, his mission was to teach children how to avoid dangerous situations. With the support of Congressman Steve Israel (D)-New York and Congressman Paul Ryan (R)-Wisconsin. A Bill was created and passed, allowing The Stranger Safety Awareness curriculum to be used in every school throughout the United States. As a celebration, CNBC hosted “The Night of Hope” benefit and invited Malachi to perform at the estate of Katrina and Don Peebles, chairman and chief executive officer of Peebles Corp. Malachi was honored to be a part of this national movement towards child safety, and promotes child safety in every performance and interview. * Laura Lee, The kibo Japan producers and performers received a letter from Governor Chris Christie commending there efforts in helping the victims of the tsunami. In March 2011, Disaster struck Japan with an earthquake followed by a tsunami. The Death toll exceeded 10,000 citizens. People from many cultures and countries came together to help support the survivors of this massive natural disaster. Among the many volunteers; Laura Lee, a young high school student, organized the “Kibo Japan” benefit in Tenafly, NJ to help the Tsunami survivors. With the help of Mayor Sophie Heymann and fundraiser organizers John and Cathy Coppolino; many came out to support this promising benefit. Including performers from the Metropolitan Opera, the New York Philharmonic, Grammy Award winners and host Super Model Emme. Malachi was honored that Laura invited him to join some of the most profound performers in support of this outstanding benefit. This learning experience of the Japanese Culture captured the beauty of their traditions during this insightful benefit. On January 12th, 2010, the Island of Haiti was struck by a devastating earthquake. The Death toll exceeded 300,000 citizens and left another 300, 000 injured and homeless. During this devastating time, people from many nations rallied together to help rebuild Haiti. The category six quake struck not only the Haitian community but the hearts of many worldwide. With the help of John and Cathy Capollino, a coalition of groups constructed the “Sending Our Love to Haiti” benefit. The sole purpose of this benefit was to come together and support the Nation of Haiti. Held at the Bergen Performing Arts Center, The Sending our love to Haiti benefit Featured Guest speakers and performers from all over the country. Guest Ranged from Ambassador Young-Mok Kim, Consul General of the Republic of Korea in New York, to Dr. Jennifer Ashton, a physician at Holy Name Hospital. The night brought forth performances from across the musical spectrum; Yunah Lee the lyrical soprano from the Metropolitan Opera to Broadway performer Nancy Ringham Smith of “Beauty and the Beast”. Along with this list of artist, six-year-old Malachi had the exclusive honor of performing with Five time Grammy award winner Roy Wooten. The funds from the benefits helped to send Doctors to Haiti to help support the recovery. * Mayor Michael J. Wildes presented Malachi, and the Samedy family a Proclamation for demonstrating a stellar example of tireless dedication and commitment through their community involvement. Summer 2010, Malachi participated in the "All Things Are Possible Tour". The aspiration of this tour was to inspire inner city youths and to teach the affirmation, "You are stronger than your circumstance." KTOI Management, LLC. thought the premise of the tour would be beneficial on two fronts, the first; to give back to much needed communities and to the inner city youths. To show them while having a great time they can be anything they want to be; doctors, lawyers, even musicians. The second front of the tour was to help Malachi gain a healthy and strong understanding that; Celebrity is not about excess, but that celebrity is about access. Access to those most in need of help and most in need of encouragement. Malachi visits five children's locations, sharing his music and message. During the tour along with his growth as a performer, Malachi has grown as a person. Bringing heartwarming smiles to the many children that shared in his performance, you could see the message in bloom, building character not only in the students enjoying the performance but in Malachi as well. A cultural anchor of Harlem, the National Black Theatre was founded in 1968, created in the uproar of the civil rights movement by Dr. Barbara Ann Teer. One of Harlem’s most historic venues NBT is abundant with colorful African artwork and decor bursting with warmth and a deep sense of cultural pride. NBT's spaces host all manner of performances, musical and dramatic, as well as lectures, workshops and dance classes. Amongst some of these programs, the Communications Arts program which focuses on “performance art that is meant to educate, empower, and entertain” has been the most influential part of Malachi’s development.